Lamb Kabobs recipe by Mariam at PakiRecipes.com. 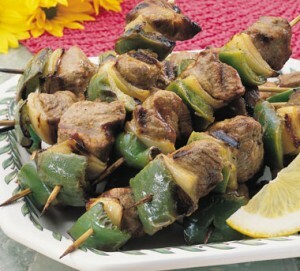 Trim excess fat off lamb, cut meat into 2.5 cm (1 inch) cubes and put in a large bowl. Crush garlic with salt and combine with remaining ingredients, mixing well. Pour over lamb and stirs making sure each piece of meat is covered with the spice mixture. Cover bowl and refrigerate at least 3 hours, or as long as 4 days. Thread 4-5 pieces of meat on each skewer and cook under a hot grill, allowing about 5 minutes on each side. When nicely browns serve hot with boiled rice or parathas, accompanied vegetable dish.